The MV Afros, an Ultramax bulk carrier fitted with Anemoi’s Flettner Rotor system, has been named ‘Ship of the Year’ at the Lloyd’s List Greek Shipping Awards 2018. The 64,000 dwt newbuild vessel, managed by Piraeus-based Blue Planet Shipping, is the first geared dry bulk carrier to be equipped with Flettner Rotors. Blue Planet Shipping announced they were proud to have received the award and are committed to protecting the environment and putting their sustainability policies into action. Action means investment and they strongly believe that the future lies in renewable energy. Their whole team both ashore and onboard is very proud and grateful for receiving this prestigious award. The installation includes four rotors which reduce vessel fuel consumption at sea and, when in port, can be moved along the deck clear of cargo handling gear, preventing any impact on port operations. The SDARI-designed vessel, which was built by China’s Jiangsu Haitong Offshore Engineering Co. Ltd. and delivered in January 2018, is fitted with a Ship Energy Efficiency Management System consisting of variable frequency drives for primary pumps and fans, reducing onboard power needs. The Flettner Rotor system, designed and installed by British company Anemoi Marine Technologies, utilises the aerodynamic phenomenon known as the Magnus Effect to provide useful propulsion to the vessel by harnessing wind power to enhance vessel efficiency, reducing net fuel consumption and lowering harmful exhaust emissions. “There has been significant momentum building in wind technologies over the past few years and this award recognises the hard work of all those involved in this project. 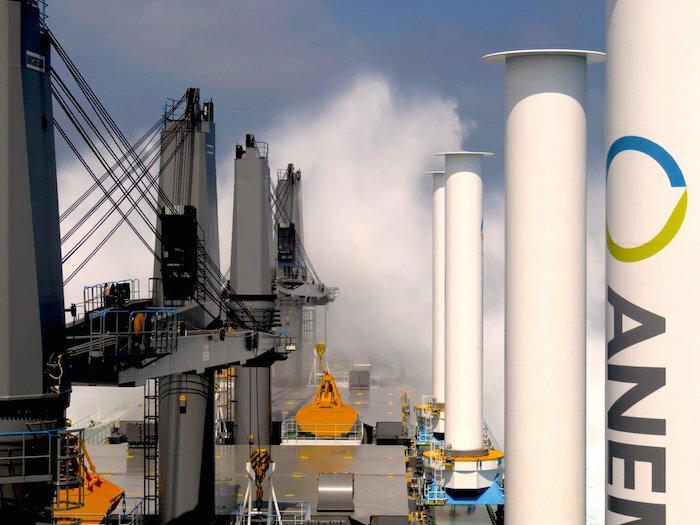 This is a positive result for the advancement of Flettner Rotor technology and more broadly, innovations in renewable energy sources for the commercial shipping industry,” Nick Contopoulos, Director, Anemoi, said. Anemoi is now planning future installations to further demonstrate the viability of this technology for shipowners and operators.